Kitty Valentine invited me round to Worship St for tea on Saturday afternoon to visit her tiny apartment in the terrace designed by the pre-eminent Arts & Crafts’ architect Philip Webb in 1862. These buildings were conceived as living and working spaces, with a workshop in the basement, a shop on the ground floor and dwelling for the family on the floors above. 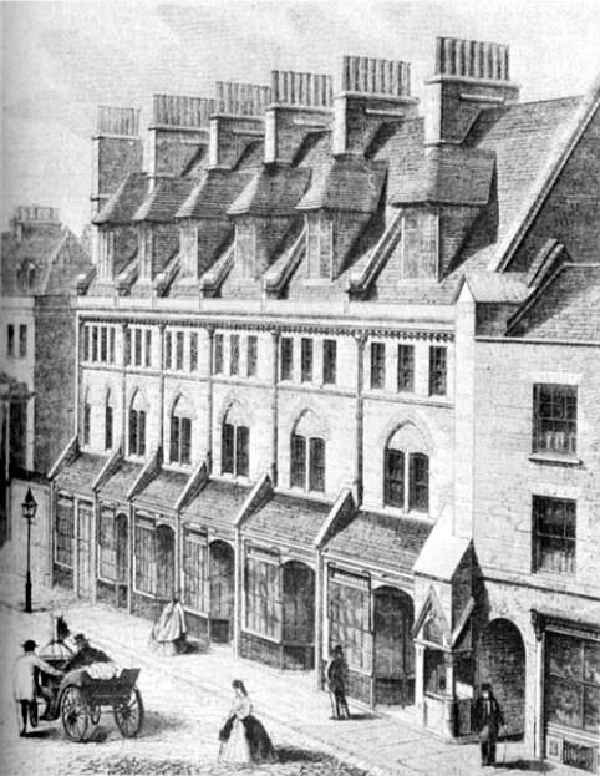 Designed in a handsome neo-medieval style with modest proportions yet providing decent living conditions for the artisans, they represent an admirable social ideal – though, disappointingly, the terrace was later divided up into offices and now each floor is let out as a separate dwelling. Kitty’s flat occupies a space that was previously a shop and we enjoyed a lively conversation as we drank our tea upon the raised platform in front of the window, originally used to display items for sale. Kitty was attracted to the building when she first saw a little picture on the letting agents’ website and, two years ago, she persuaded the sceptical landlord to let it to her when he was suspicious of artists, preferring City workers whom he believed were more responsible. A presumption that we hope he has revised in the light of recent events. 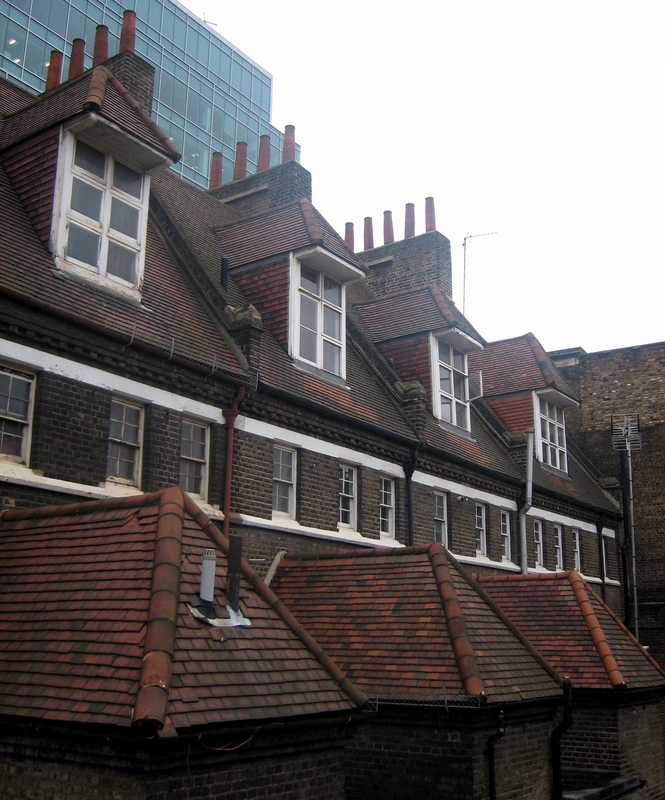 It was an inspiring discovery for Kitty to learn of the noble origins of the building, once she had moved in, especially as was she studying screen-printing at the Working Men’s College in Camden, which had been founded by William Morris and where Dante Gabriel Rossetti taught. Although history may have taken Philip Webb’s building away from its conception and purpose, in her part Kitty has brought it back to its origin as a creative space. Lining every corner of her flat with her wonderful market finds, clothes and artwork (all lovingly organised, arranged, displayed and cared for), Kitty has fashioned an exquisite bower. A nest woven by an ingenious magpie with a million glittery, flowery, feathery things to create the charismatic living space of a woman with with a rich self-confident imagination. I was spellbound by this secret feminine enclave at the base of the vast steel Broadgate Tower. There is a brave side to Kitty that is not at first apparent. She is her own woman, who through hard work and directed intelligence has found a way to support herself as an artist. She has won an independent life, making her work here in the living place that she has established. It is a room of her own, which even today can be elusive for many to achieve, but remains essential for anyone pursuing creative work, as a private imaginative space. Somewhere to discover who you are and work out what you are capable of. 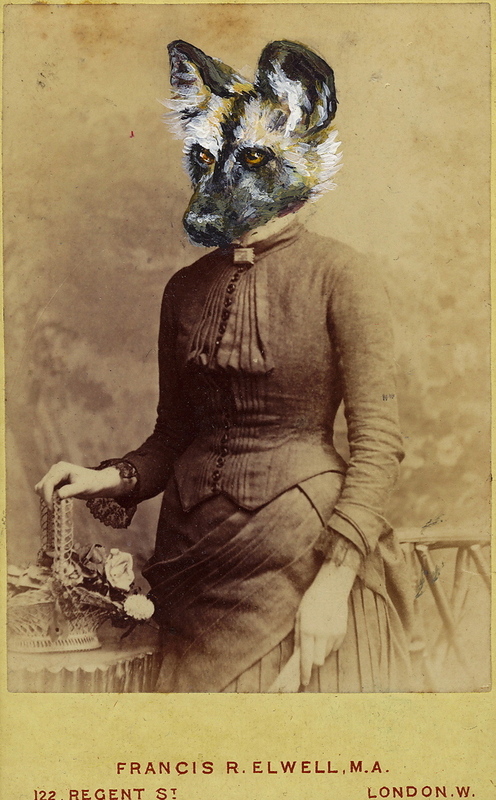 Kitty showed me her recent work, a series of miniature paintings, embellishments upon nineteenth century portrait photographs, which she titles “Victorian Mischief”. 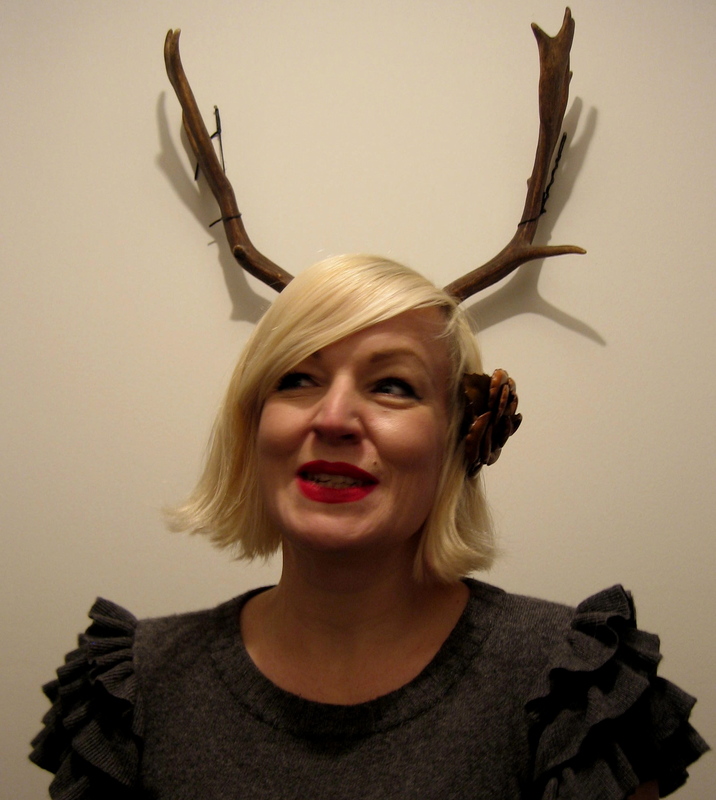 Kitty’s work is an entirely personal and darkly humorous vision of the Victorians, in which prim and proper worthies and nobility, encased in their uniforms and corsets, acquire animal heads and skulls, with horns or antlers. It is a curious perspective, Lytton Strachey undermined in the spirit of Max Ernst’s collage novel “Une Semaine de Bonte”. But more than this, Kitty’s works are superb paintings, executed with the skill of a miniaturist and revealing an acute ability to express the paradoxes of the human personality. “I look at them and I know what animal they are going to be,” says Kitty describing her response on the discovery of new examples of these small unloved anonymous cabinet photos. Produced in millions by nineteenth century photographers, they were made in addition to the sitters’ prints as disposable advertising material. I think Kitty’s work has a captivating poetry, proposing images of the hidden emotions and imaginative life of the unknown subjects, while also enriching their mystery by masking their faces with bizarre yet strangely appropriate replacements. And it is a measure of the power of her imagination that you cannot envisage these pictures anymore with mere human faces. This is serious work that explores the tensions and contradictions of our relationship with photography, and with the past, but it is the tenderness of these pieces that touches me most. In the strange world of contemporary art, it takes courage to be tender and, in my opinion, courage is Kitty Valentine’s defining quality. You can see more of Kitty Valentine’s work by clicking on her name at the top of this story which will take you to her blog, where you may also click on her Etsy shop. Prints of the “Victorian Mischief” series are currently also available at the Two Magpies Emporium in the Tea Room Market in Brick Lane each weekend. If you look closely at the nineteenth century engraving of Philip Webb’s building below you can see the niche where I photographed Kitty Valentine on Saturday. Congrats to Kitty, a wonderfully wicked artist! Really pleased for you Kitty, it’s about time you were noticed for being talented and wonderful. That is a wonderful article Kitty, you are such an amazing woman!!!! Kitty Valentine lives and breathes art, love and romance from an age long past. Never has a woman been so passionate about the connection of these three things. And the photos of her really don’t do her justice. She’s hotter than hell in the flesh!